This sky was a total gift – a watercolor of winter pastels. By contrast, the bared branches of these trees grow and twist amongst each other. Their artistry enhanced by their nakedness. But our eyes ignore all of that – we focus in on the subjects. The dapper groom standing straight against the chilly morning. And his bride, coming out across the snow to join him on the most important day of their lives. 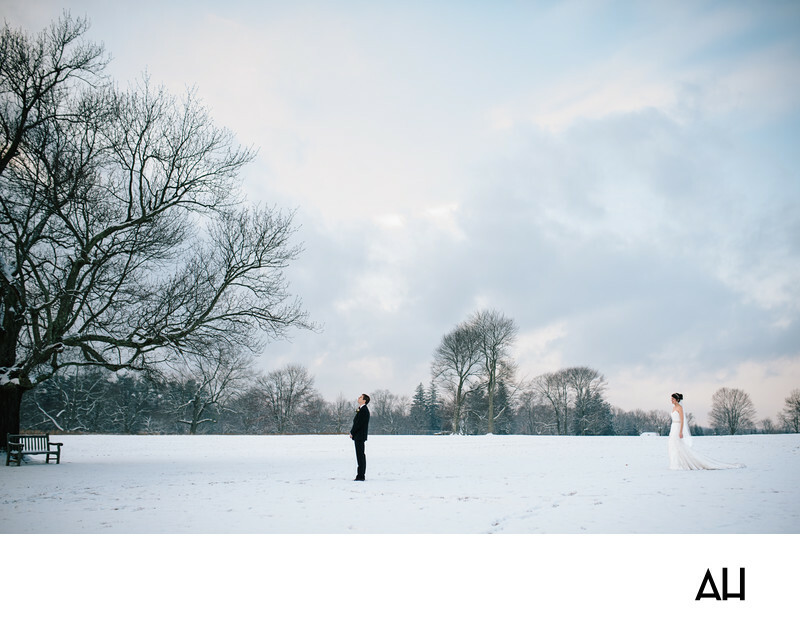 There is such magic in a winter wonderland wedding. I love the crisp, clear air a fresh snowfall leaves behind. While all of nature sleeps, it also somehow seems more awake than ever. The crunch of groomsmen’s shoes on the packed snow. The scape of a shovel – clearing the path for the bride’s more delicate heels. Sounds are so much more distinctive in the echoing winter air. Even the light has more drama in the wintertime – the glare of noontime sun on fresh powder, followed by an early, burning sunset. And the shorter days mean longer evenings of revelry. Even though it requires extra layers, guests seem more festive when they arrive at winter weddings. They’ve made a special effort to be there, but why shouldn’t they – it’s a special event. Indoors, everything takes on extra sparkle. A bridesmaid’s earrings, or the candlelight reflected on a wineglass.